I am sure all most of you have heard of it. Yes, I Signed up for SocialSpark, the social marketing network a few weeks ago. Initially, it was quite difficult for me to get to know the system and I didn't really spend much time on it. There are so many options and features. Finally when I figured out (duh! I have to put a code at my site! ), it is just a walk in a spark park! SocialSpark is the newest offering from Izea which allows you to expand your online community as it connects advertisers and bloggers. 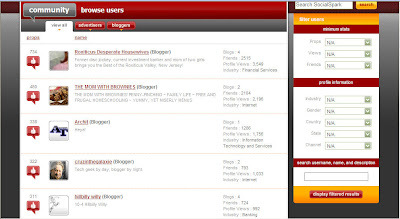 Here, you are able to browse the public profiles of advertisers and bloggers along with their associated sponsorship and blog related data. I found some great blogs and get to interact with new friends by leaving comments, sending individual messages and giving each other props as well. Besides that, bloggers can choose to monetize their blogs by creating sponsored blog posts. 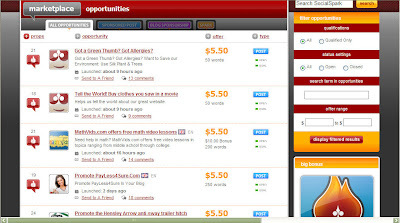 I found there are many opportunities (sponsored posts, blog sponsorships and sparks) at the marketplace. One thing I like about SocialSpark is, it allows you to write a review based on your 100% real opinions. Isn't that good? I believe your readers will appreciate your honesty. Oh, it is 100% transparency too. You can tell your readers that you are being paid to write this! But I haven't taken an opp yet because I haven't figured out that queuing system. So far, I have yet to find out what I don't like about SocialSpark. Let me explore more on it first. All Some of my bloggers friends have already signed up but how about you? Have you signed up for SocialSpark yet? Check me out and let's spark with SocialSpark! This post is brought to you by SocialSpark. Hey, sounds great. I will have a look in it. Hi Monica, too much stress for me on that, ha ha. but you have a good time, enjoy. Lee. Sayang, what code ya need to add? I forgot already lah. So sowwie! You talking about the Policy Disclosure issit? It's OK my dear!! I didn't put the the itk and claim code at my site. And also I didn't know that have to claim my blog before I submit it for verification...thats why the status was hanging there..hahaha..
Hi Monica, Wao,something new again, you are very adventurous. Hopefully I can manage. Yay~! Another one on board! Welcome! I'll add you up to my list of friends! :) Enjoy!! Ok ok. I join I join.